Bill Poulos, cofounder and CEO of Profits Run, Inc., today announced his position on the government shutdown, the U.S. federal deficit, and gave insights into a cryptocurrency driven economy that would curb the government from creating more debt. This all comes in the wake of day 3 of the government shutdown. Bill Poulos, Co-Founder, Profits Run, Inc. This is all the continuing part of the continuing Washington soap opera that for many folks has become very tiresome, as they see the same routine played over and over again to no consequence. As reported by PBS, today marks day 3 of the government shutdown. The government shutdown began on Saturday, January 20, 2018, when government leaders could not agree on government spending plans. “Having a bitcoin driven economy, the government would no longer be able to print dollars by selling treasury bills to the Federal Reserve (who simply then creates the money out of thin air). Why? Because you cannot create bitcoin. I understand there is only a fixed number of bitcoin. So what are the implications in that scenario for a government shutdown? Well, the government would still need to appropriate funds for various government agencies. But those funds would have to be from tax revenue only, with no opportunity for deficit spending beyond what the tax revenue provides. Bill Poulos was born in 1947, married in 1969, and has 3 grown children. Together with his son, Greg Poulos, he established Profits Run, Inc. Profits Run is a financial education company. 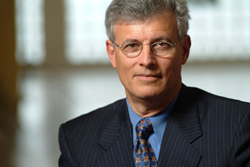 Bill Poulos is an American investor and veteran financial educator. He is famous for his short-term investment philosophies that emphasize consistent rules for risk management. Government shutdowns can occur because Congress passed the anti-deficiency act in the late 1800s. This act prohibits government agencies from spending money unapproved by Congress. If congress cannot agree on a budget prior to the time period when the new budget would go into affect, the government shuts down. It does not reopen until Congress agrees on what money will be spent where. Cryptocurrencies are digital currencies where techniques for encryption are utilized to regulate the creation of currency units and to verify fund transfers. Cryptocurrencies operate outside of the banking system. Bitcoin is a cryptocurrency. In 2001, Profits Run, Inc. was cofounded by the father son duo, Bill Poulos and Greg Poulos. Profits Run received its namesake from a popular saying amid traders, “Cut your losses and let your profits run.” Profits Run’s mission is to show people a safer and simpler way to invest their money.